There’s a park in Davidson, NC called Fisher Farms that’s very close to my house. I go there quite often to run and walk the trails. 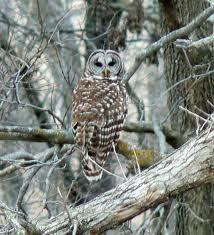 It’s pretty cool, I’m even friends with a Barred Owl that lives there in the woods. Mind you, I’m his friend. I don’t think he’s mine yet, but I’m working on it. Anyway, I haven’t got to that point that I’ve heard runners allude to as to how running is a “spiritual thing” for them, but I did have some thoughts out there in the woods, and figured I’d pass them along. One of the first things I noticed as I began to frequent the trails was all of the exposed roots from the various trees that literally carpet the ground. There are so many trees and so many roots that you can’t tell which roots belong to which trees. Obviously, the trees are distinct, but the roots twist and turn and overlap in such a way that makes it impossible (at least for me) to assign a tree to the roots. I started thinking that that is kind of how it is (or should be) for us Christians. We are each ” planted” in Christ, our “roots” are all drinking from the same source. And as we spread out, growing in Jesus, there should be a “blending,” a unity in the Spirit as our common thirst, the need we each have to drink of Him produces an “overlapping root system.” As we grow in Christ together, our roots mingle, and we began to look alike- conformed to the image of Jesus. It takes more than one tree to make a forest and more than one Christian to make up the body of Christ. May our roots go deep into him, each of us taking on his likeness, reflecting his glory in congruent diversity. And oh yeah, don’t let the Barred Owl distract you! !